Just a few min. old. Days old. Evan though he's 10x's bigger now, I can still see the same features in this picture as he has now. I hate to admit it, but this is the most recent, decent picture I have. This is about 5 months old. I'm a terrible mom! I cannot believe that it has been a year since my baby was born! Where did the time go! I know every mom says that, but this year flew! 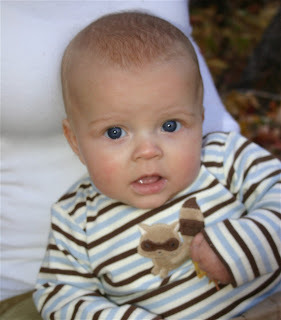 I don't ever remember a time where I looked and how many months old he was and thought, "Really, he's only __ months old?" I'm sure it has to do with the fact that he's the 4th child and everyone is busy with their happenings. Poor guy! I really have loved every day I've had with him. He is the happiest little guy you'll ever meet. The only time he is fussy is when he's tired or hungry. You'll know when he's had enough, because if you walk past him, he'll follow you with his gaze and once you pass him, he'll start to cry. I thought for sure he'd be walking by his first birthday, but it looks like he'll follow the trend and wait a little longer. He'll take a step and then lunge forward. He gets so excited when he sees people and will say hi, over and over in the cutest high pitches voice. He waves hi and bye and blows kisses. He says mom and dad and even though no one else would understand it, I'll even hear an occasional Tanner, Tyler and Jake. Obviously, its not that clear, but you can tell he's trying to say it. He also get so excited with the dog is around and says dog and signs it as well. He signs more and drink also. The morning of his birthday, Sat. July 4th, the rest of the kids had spent the night at my parents so we had him all to ourselves. He woke up and I drug Tyson in his room with me and we sang happy birthday to him. He was so excited! He kept rubbing his arms up and down his chest with such excitement and had the biggest grin on his face! Whenever someone would start to sing Happy Birthday to him during the day, he'd get the biggest smile. Last year, as we woke up on the 4th of July, we were just laying in bed about 6:30am when the phone rang. We were expecting the phone call, as I was to be induced that day. My Dr. was fine with inducing me since I go really fast and she was guaranteed to be done with me by fireworks. Not that she wouldn't have stayed if I would have gone into the fireworks, but we had it all scheduled out. She's such an awesome Dr!! I actually shouldn't put her down like that. She's a great midwife! If she was a doctor, I would have never had him on the 4th! In any event, the call came bright and early and they said they'd take me whenever I got there. So, we hurried and got our stuff together to head to IMC. Again, my mom had the kids. Once we got there, it was about 45 min. before they started me and 3.5 hours later I held the cutest 6# 9oz 19 in. little boy I'd ever seen! (I can say that, because the other two boys were different weights and lengths!) His labor was different than Jakes. For one, I was so worried I was going to have complications again and lets face it, those kinds of complications aren't in any way fun if you don't have an epidural. But the contractions were spaced apart to the point where as soon as one was over, it was as though nothing was happening. I was fine to sit and laugh and joke around and have a conversation with no problem at all, then when the pain would worsen again, I'd focus and work to get through it. I'm so glad this little guy, well, really he's a chunky monkey, is in our family! Happy Birthday buddy! Now, for our 4th of July, we had a crazy 48 hours! Friday night, my mom took the kids because my sister is in town and they wanted to play with their cousins and go to the hot air balloon festival on Saturday morning, which was really only doable by spending the night, they just have to get up way too early. So, Jefferson and I headed up to pick Tyson up from work about 6pm and headed to his bosses house for the evening. We've been doing this for the last few years and always have a great time with tons of really good food! After the socializing and dinner, we waited for 10pm for the fireworks to start. This is always a little nerve racking just waiting to see how the kids are going to handle the fireworks. I can honestly say I've never seen a kid so calm during fireworks. He was very relaxed and calm throughout the entire thing. He just laid up against me and every few minutes you'd hear a very soft, ahhhh. We got home about 11:30. Saturday morning we woke up, I hurried to get ready so I could go pick up balloons for Jefferson's birthday. Then we headed down to the park just down the street for our annual ward/neighborhood breakfast and parade. We missed the breakfast, but made it for the parade. Jefferson even got his picture taken with one of the firemen in front of the firetruck. He was lovin' life. Any time anyone would say or sing Happy Birthday, he'd get the biggest grin on his face. He knew it was for him. Then we came home, gave Jefferson a nap, welcomed the other kids home and got ready for a BBQ with grandma and grandpa Lybbert. We had our BBQ and then Jefferson got his birthday cake and made the biggest mess any of our kids have ever made, and was very happy to do so. Poor Tyler was the unlucky one to get burned from a sparkler. They really do cause damage! She had a nice blister in the space between her thumb and pointer finger. It pretty much ruined the rest of her night, but only because she's our drama queen. I'm sure it hurt pretty bad, but I'm sure she milked it for all it was worth too! Jake LOVED the glow sticks! L to R Gus, Tilie, Dallan, Kailee, Tanner, Tyler, Grandma and Grandpa holding Jefferson and Tyson and Jake in the back ground. Becky and I were taking pictures. This picture was not posed. Grandma just had a great photo opp. and took it! Even though Jefferson looks a little stressed right here, he was just trying to reach his head to see the fireworks coming up from out of the stadium. Saturday we decided to take advantage of the nice weather we were having, and headed up to the Utah Arts Festival. The kids asked what that was, and Tyson told them its a place where people sell art that they've drawn or made. Well, little did we know how this would be translated. Tanner decided to go downstairs and start drawing pictures that he could sell at this Arts Festival. Imagine the look on his face when we told him he couldn't sell it at the festival. You would have thought his puppy was just run over. He started carrying on telling us how much we must hate his art work for us to have the nerve to tell him he couldn't take it to sell. I think by the end of the day, he finally realized exactly what we were talking about. Tyson did tell him the people who occupy the booths up there, pay lots of money in order to sell their goods there. I thought it was funny he was so adamant about selling his drawings. We also decided to get the kids faces painted. Oh WOW! Is all I can say. I guess since its an art festival, the people painting faces, of course, are artists. So why wouldn't they want to use your entire face as a blank piece of paper. I was finally able to talk them out of painting Jake's whole face, not sure of how he would handle it. But she was really confused as to how she was supposed to draw something just on his cheek. Tanner decided to go with Darth Mal (sp) and Tyler is in this puppy phase, where everything she does and wants is puppy oriented, so she decided to have them draw a dalmatian dog. Sure these are cute and all, but let me just tell you the fight we had to wash their faces. It wasn't even that they wanted to keep these cute artistic expressions on their faces. Oh no, they just didn't want their faces washed. If you would have been within a 5 mile radius of our house, you could have heard Tyler screaming! And let me tell you, the black was not the easiest to get off. As it was, I used my face wash to take it off and Tanner and Tyler still looked like they were wearing eye makeup. It was fun and the kids had a good time. Tyler wasn't very happy. She'd taken a drink of water and forgot she had paint on her face and wiped the water off, which in turn, smeared some of the paint off her face. Later that evening at a BBQ, Tyson found her in the bathroom trying to wash the rest of it off her face. Jake was being silly in this picture, which is why there are two of him. He gets in these moods in the late afternoon, mainly because he's tired, but everything you ask him to do, he'll do the opposite. Tyler after her attempt to remove the pain from her face. Little did she know what was in store for the next 3o min. as we worked to get the leftovers off!! Or really, I should say, little did we know! This was taken "pre-wash". At this point, Tyson had gotten what he could get off with just warm water.